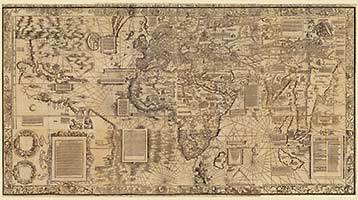 The Library of Congress has authorized Levenger Press to reproduce two world-changing maps in its collection from the 16th century. 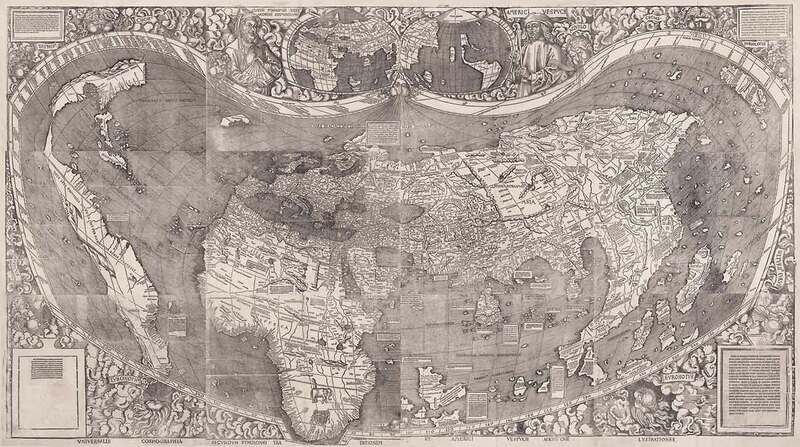 One map was the first to show the word America. 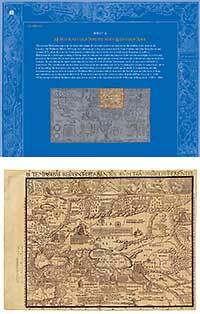 The other is the first printed nautical map of the world. The largest authorized full-color reproductions of these maps, and their fascinating story of knowledge that was ahead of its time, are found in Seeing the World Anew. Scroll down to see portions of the maps. Not everyone who changes history becomes a star in the history books. This was true of a sixteenth-century humanist and cartographer named Martin Waldseemüller, whose maps of the world were so radical that they went virtually underground for four centuries. 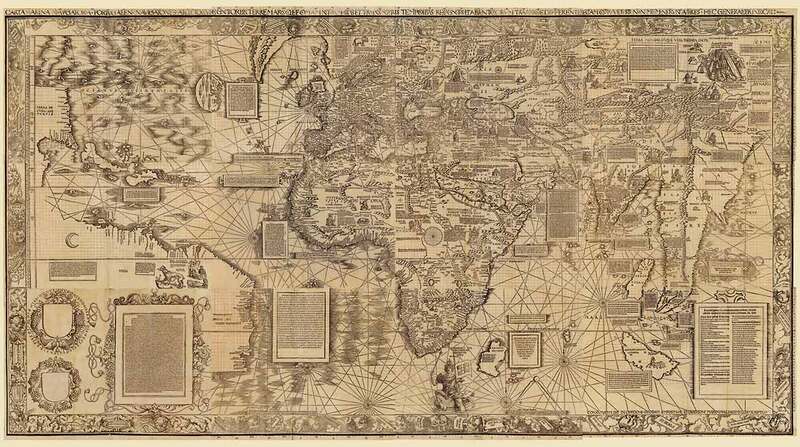 When he re-visioned the world with his 1507 World Map and his 1516 Carta marina (“sea chart”), Waldseemüller didn't get all of it right—few visionaries do—but he made some huge leaps in knowledge. Among the most startling was maintaining that North and South America were surrounded on their western sides by an ocean. They were not part of Asia, as even Columbus thought. How on earth did this man—living in a small, landlocked town in Europe—know this, years before Balboa would purportedly discover the Pacific Ocean and Magellan would sail to it? And it was Waldseemüller who first put America on the map. 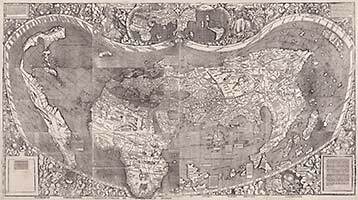 Up until this point the New World had never been identified on any map by that name. 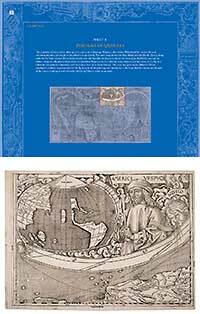 “Waldseemüller's 1507 map was a radical departure from all previous world maps, and its creation and depiction of the world is surrounded by unanswered questions that have plagued scholars, amateurs and charlatans, almost since it was conceived,” says John Hessler. John is a Senior Cartographic Librarian at the Library of Congress and a Fellow of the Royal Geographical Society. 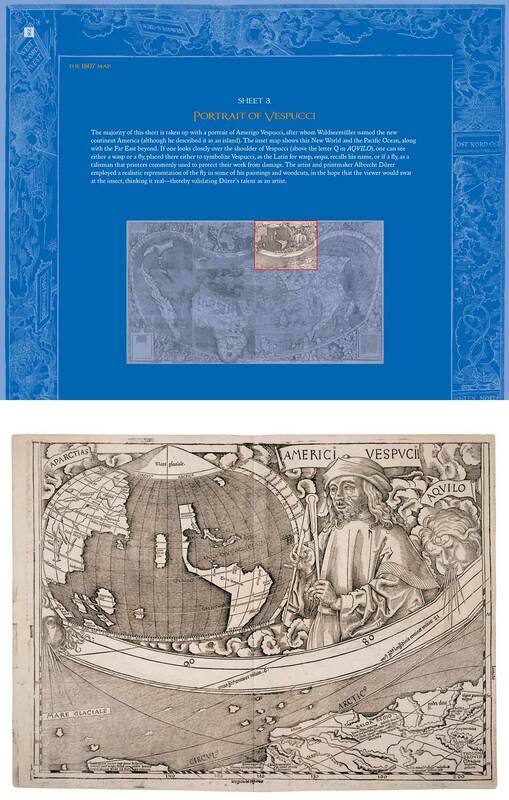 His colleague Chet Van Duzer is an Invited Research Scholar at the John Carter Brown Library who has published extensively on medieval and Renaissance maps. Both are leading authorities on the Waldseemüller maps and provide the fascinating narratives in Seeing the World Anew. Waldseemüller created each map in 12 large sheets. Here are two of those sheets, as they appear in our Levenger Press book Seeing the World Anew. Each sheet is approximately 11" x 14". 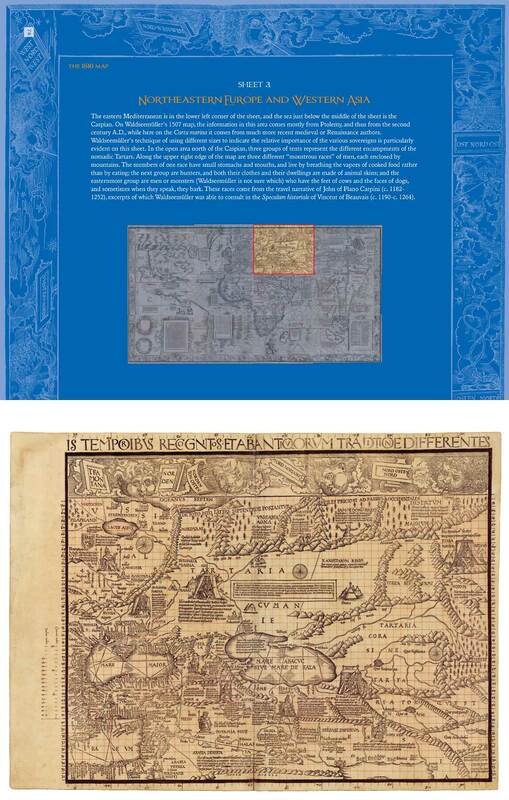 John provides the commentary to the 1507 map; Chet, to the 1516 map. Here are the composites of each map, which are folded loose into pockets in the book. Each map unfolds to approximately 2 feet by 4 feet. No sooner had Waldseemüller's maps burst on the scene than they seem to have quickly disappeared. It would take nearly four hundred years, till 1901, for a Jesuit priest combing through an ancient library in a German castle to uncover the single remaining copies of each map. Both are now housed in the Library of Congress in Washington, D.C. Spend some time with these maps, laden with symbolism that John and Chet decode, and you, too, may find yourself seeing our world anew. 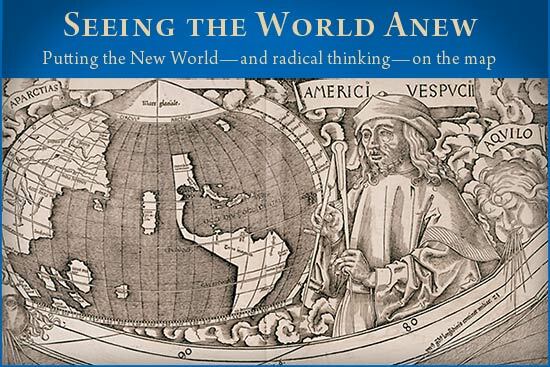 Images and commentary excerpted from Seeing the World Anew: The Radical Vision of Martin Waldseemüller's 1507 & 1516 World Maps, Levenger Press 2012.